An all-important parliamentary vote on the draft withdrawal agreement is due to be held on Tuesday next week. If the prime minister's deal is voted down on Tuesday — as many analysts expect will happen — the government would only have three parliamentary working days to come up with revised plans. The People's Vote campaign said lawmakers should amend the motion by calling for a second referendum. An anti-Brexit demonstrator hold placards opposite the Houses of Parliament, in London, Britain, November 13, 2018. With less than 80 days to go until Britain is set to leave the European Union, campaigners hoping for another Brexit referendum have laid out their preferred path for a fresh vote. Britain is scheduled to leave the European Union on March 29 but, as the country's deadline for departure draws ever closer, what will actually happen on that day remains far from certain. Embattled Prime Minister Theresa May is still struggling to overcome deep opposition to her proposed withdrawal plan, opening up a range of possibilities from a disorderly exit to the whole process being scrapped altogether. "Nobody has come forward with a proposal that could secure a majority in the present circumstances. The blunt reality is that such a proposal does not exist," the People's Vote campaign group said in a report published Wednesday. "We believe the only credible way forwards for MPs (Members of Parliament) will be to hand the decision back to the people." Westminster must decide whether to accept May's plans for a structured exit and relatively close economic ties or reject it and spawn uncertainty over the country's next steps. May has repeatedly rejected the idea of a second referendum on leaving the bloc, but the campaign for a so-called "People's Vote" has attracted some support in Parliament. The government was expecting to have a 21-day period to file a parliamentary motion but U.K. lawmakers backed calls to bring the deadline forward on Wednesday afternoon. The People's Vote campaign said in the report that lawmakers should amend the so-called "plan B" motion by calling for a second referendum. The U.K. would then be forced to extend its timetable for leaving the EU to allow enough time for another referendum, which is likely to take months to organize. Holding a second referendum on Brexit would almost certainly require an extension of Article 50 to push back the March 29 deadline. But, that is no simple task — all EU countries would need to agree to a deadline extension at a vote of the EU Council. Nonetheless, the People's Vote argues all other EU member states would "willingly agree" to extend Article 50. "It is our view that in these circumstances the EU would grant an extension, and that the government would not face any political or procedural obstacle to holding the People's Vote that could not be overcome," the report said. On Tuesday, Britain's Brexit Secretary Stephen Barclay ruled out the possibility of the U.K. government seeking to extend the March 29 deadline. His comments followed reports that suggested U.K. and EU officials had discussed whether prolonging the negotiating period might be possible. The People's Vote said a second referendum should ask a binary question such as whether voters wanted to accept the government's draft withdrawal agreement, stay in the bloc, or another form of Brexit versus staying in. What is the People's Vote campaign? Launched in April 2018, the People's Vote campaign group has spearheaded an increasingly vocal push for a second referendum on Brexit. Former Prime Minister Tony Blair, former Deputy Prime Minister Nick Clegg and British actor Patrick Stewart are among some of the high-profile backers of a second Brexit vote. However, pro-Brexit groups argue that holding another referendum would be undemocratic. Instead, they say the government should work to deliver the result of the 2016 referendum as quickly as possible, and on the best possible terms. 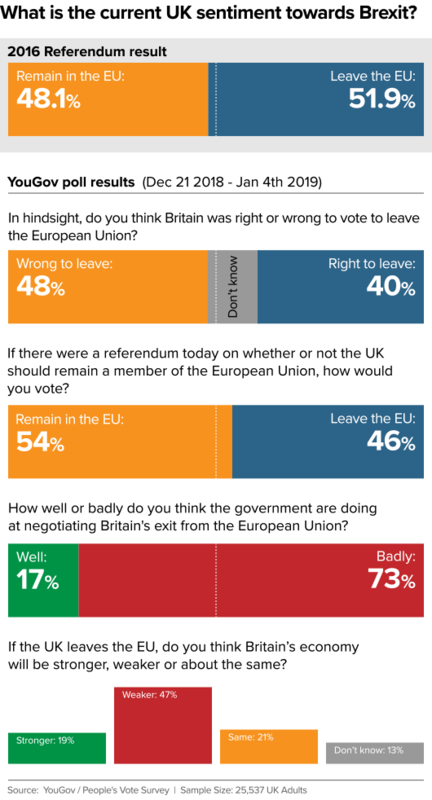 A YouGov survey published on Sunday found more Britons wanted the U.K. to remain as a member of the EU than leave. It showed if a referendum were held immediately, and those undecided or refused to answer the survey were removed from the sample, 54 percent of people would be in favor of remaining.